Lajes Field or Lajes Air Base (Portuguese: Base Aérea das Lajes), officially designated Air Base No. 4 (Base Aérea Nº 4, BA4), is a multi-use airfield, home to the Portuguese Air Force Base Aérea N º4 and Azores Air Zone Command, a United States Air Force detachment unit (operated by the 65th Air Base Wing of United States Air Forces in Europe - Air Forces Africa), and a regional air passenger terminal located near Lajes and 15 km (9.3 mi) northeast of Angra do Heroísmo on Terceira Island in the Azores, Portugal. Located about 3,680 km (2,290 mi) east of New York City and about 1,600 km (990 mi) west of Lisbon, Portugal; the base sits in a strategic location midway between North America and Europe in the north Atlantic Ocean. The origin of the Lajes Field dates back to 1928, when Portuguese Army Lieutenant colonel Eduardo Gomes da Silva wrote a report on the possible construction of an airfield in the plainland of Lajes, for that branch's aviation service (Portuguese: Aeronáutica Militar). However, the location of Achada on the island of São Miguel was chosen instead at the time for the construction of the field. In 1934, the Achada airfield was condemned due to its inadequate dimensions and adverse weather conditions, resulting in the construction of a landing strip of packed earth and a small group of support facilities by the Portuguese military at Lajes. During World War II, the designation of the airfield was changed to Air Base No.4 and the Portuguese government expanded the runway, sending troops and equipment to Terceira, including Gloster Gladiator fighters. The military activities in the Azores grew in 1942, as the Gladiators began to be used to support allied convoys, in reconnaissance missions and on meteorological flights. In addition, the first Portuguese Junkers Ju 52 arrived in July 1942 to fly cargo missions. By 1943, the British and American armed forces were allowed basing rights in Portugal, and the Royal Air Force took over Lajes Field as RAF Station Lajes. The Azores permitted British and American airplanes to protect Allied shipping in the mid-Atlantic. The airport has only one runway (152°/332°), 3314 m long and 43 m wide. The runways will have got three BAK-12 aircraft arresting systems for emergency landings and training in the beta version. Both directions are used for takeoffs (though runway 33 is much preferred). Runway 15 is usually used for visual landings and by jets. 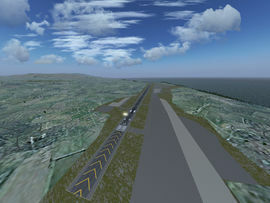 Runway 33 is suitable for all landings and is served by an ILS system (frequency: 341.00 MHz). Note The following table takes into account some frequencies available only in the current development version. J Maverick 16 is currently adding buildings and objects to the air base so that the scenery is as faithful as possible to the real airport. The buildings will be released for download as soon as they are all placed. ATC service is provided with OpenRadar sometimes on weekdays, using also Mumble when possible - check Lenny's website for the exact times and dates, but usually sessions are unplanned. The air base is part of the space program missions as airport-landing facility for the Space Shuttle and others. See the links for further information. This page was last modified on 19 April 2017, at 06:14.